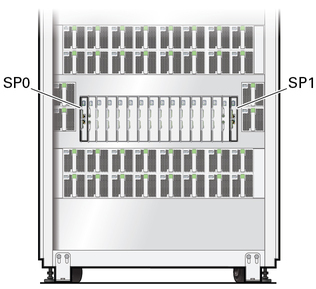 The server contains two dual-redundant SPs (SP0 and SP1) on the front of the server. One of the SPs functions as the Active SP to manage the server, and the other one acts as a Standby SP that will assume the Active SP role in the event of an SP failure. Note - Either SP (SP0 or SP1) can take the Active SP role. Do not assume that SP0 will take the Active SP role and that SP1 will take the Standby SP role. SER MGT port – Connect a Category 5 or better serial cable from this port to a terminal device. During the initial server power on, use this serial connection to monitor the boot process and perform the initial Oracle ILOM configuration. NET MGT port – Connect a Category 6 or better cable to this 1-GbE port. After the initial server configuration, use this Ethernet connection to monitor and administer the server through the Oracle ILOM console. In addition to the two SPs, the server contains up to four SPPs. Each SPP manages one DCU in the server. The Active SP and the SPPs communicate with each other over an internal VLAN. For each PDomain, one SPP takes the role of the PDomain-SPP, which manages tasks for the PDomain and provides rKVMS service for that PDomain. 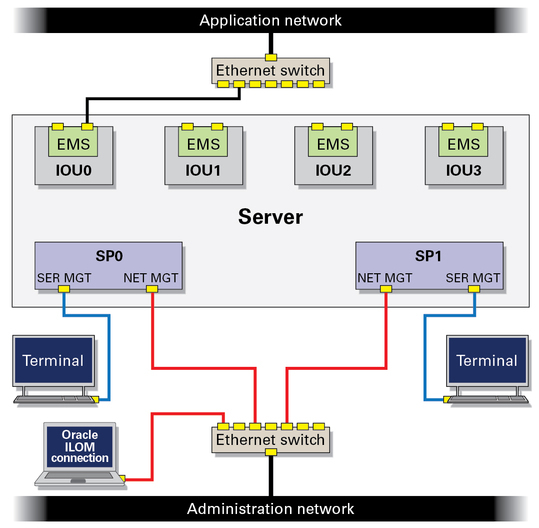 To isolate the Oracle ILOM administration network, you can connect the SP NET MGT cables to a network separate from networks used for server applications. 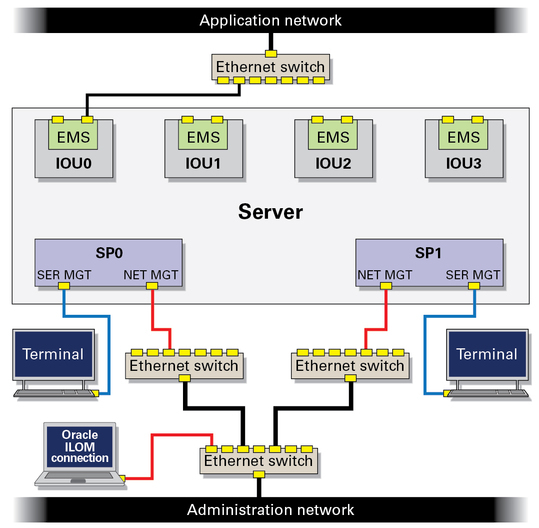 By connecting the NET MGT ports to an Ethernet switch, you can make an Oracle ILOM network connection to either SP. To add redundancy, connect each SP to a different Ethernet switch. Connect these two switches to a third switch, and connect that third switch to the Oracle ILOM console.